Published Aug 10, 2017 By Julia 7 CommentsThis post may contain affiliate links. 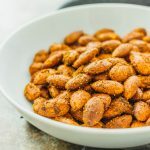 These spiced almonds have a spicy garlic flavor with a smoky taste, and are easily cooked in just 5 minutes on a pan. They make for a healthy and flavorful snack. 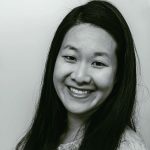 There have been countless times when I’ve headed into my supermarket’s snack aisle, determined to bring home a barrage of healthy snacks, only to find myself grabbing the same sugar and carb laden goodies every time. That’s why I started making these homemade spiced almonds. 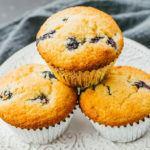 They are healthy and most definitely don’t sacrifice on flavor, and you can easily make them at home in mere minutes. All you need are whole almonds, some olive oil, and your favorite spices. 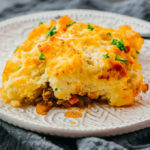 It’s a one-pan snack that you can rapidly cook on the stovetop, let cool, and then save for later as a portable and protein-packed snack. They’re great for game night parties and holidays — they help offset all of the sweet stuff that we’re used to nibbling on during these get-togethers. 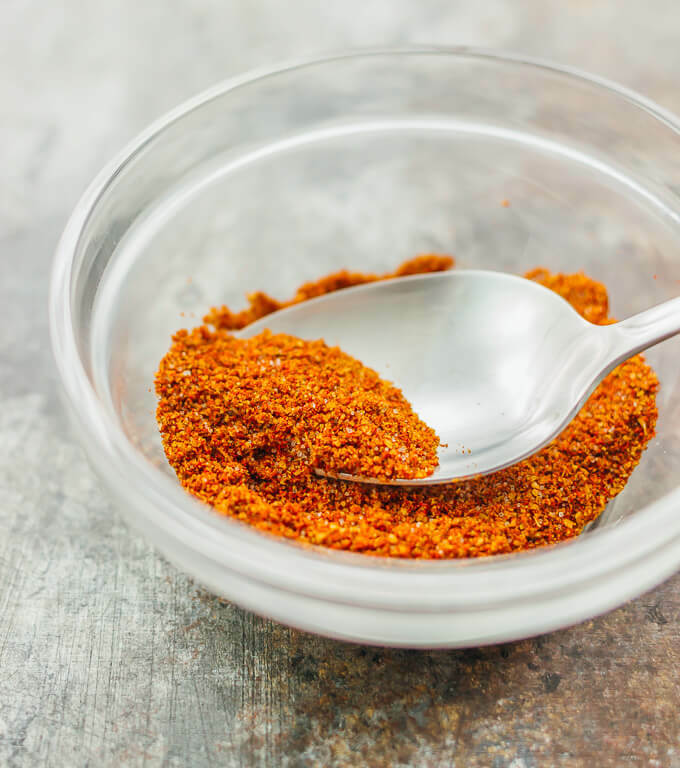 I really emptied out my spice cabinet for this recipe — these almonds are cooked with my favorite spices, including smoked paprika, cayenne powder, garlic powder, ground cumin, and last but not least, a dash of sriracha sauce for good measure. With all these spices, you might be wondering what it tastes like. I thought the paprika gave it a strong smoky flavor, Mr. Savory Tooth thought it reminded him of “garlic and onions,” and we both agreed that there was a good amount of spiciness. I tried a variety of combinations of spices before settling on the current ingredients — some things I experimented were with honey flavors, wasabi (horseradish), and soy sauce. Fast and easy. It only takes 5 minutes to measure out the spices, and another 5 minutes of cooking time. Have all of your ingredients ready and prepped — because once the pan is hot, this recipe moves fast. Healthy. I love great snack food that’s delicious and good for you at the same time. Low carb and keto friendly. Portable. 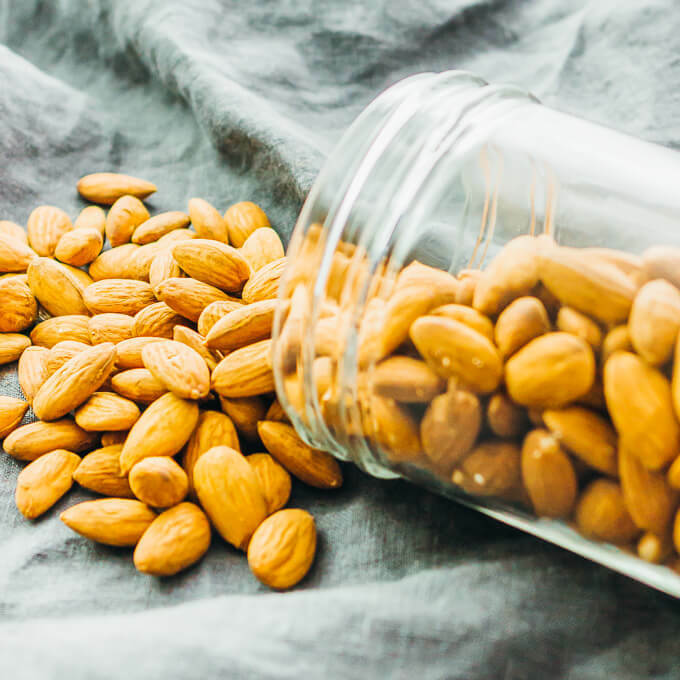 These almonds are a great portable protein snack, don’t need to be refrigerated, and can be enjoyed any time. You can bring them to a picnic, a potluck at the office, or on a hike. Vegan and gluten-free. To me, this always means that any of my friends and family with dietary restrictions will be able to enjoy this snack. This recipe yields 1 cup of spiced almonds. 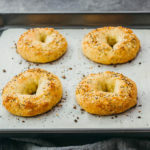 It’s enough as a snack for a few people, and you can easily multiply the recipe to make a bigger batch to feed a larger crowd. You can easily make adjustments to the spice mix, adding more or less of each to match your preferences. 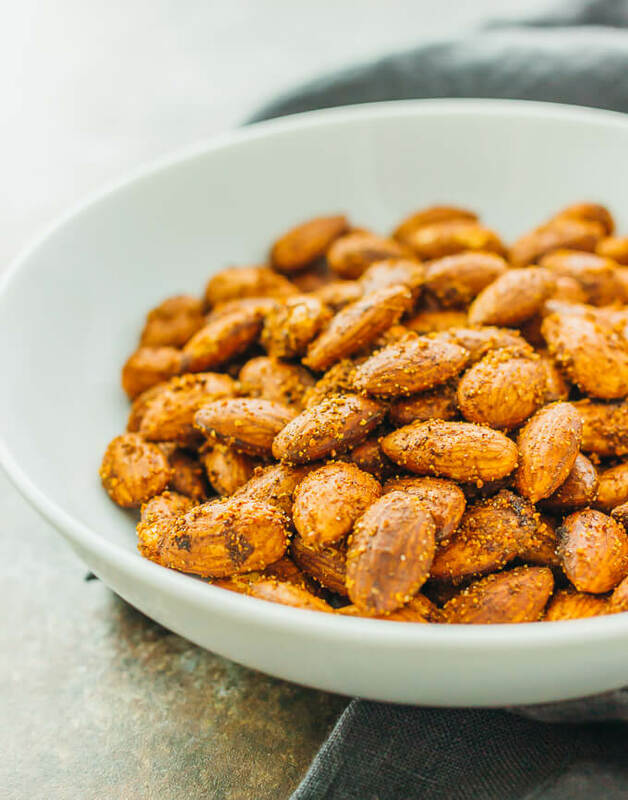 If you’re looking to customize the spiciness level of these almonds, I recommend keeping the 1/4 teaspoon of cayenne powder, and adjusting the quantity of sriracha sauce. Start with the recommended 1/2 teaspoon, and add more to taste. 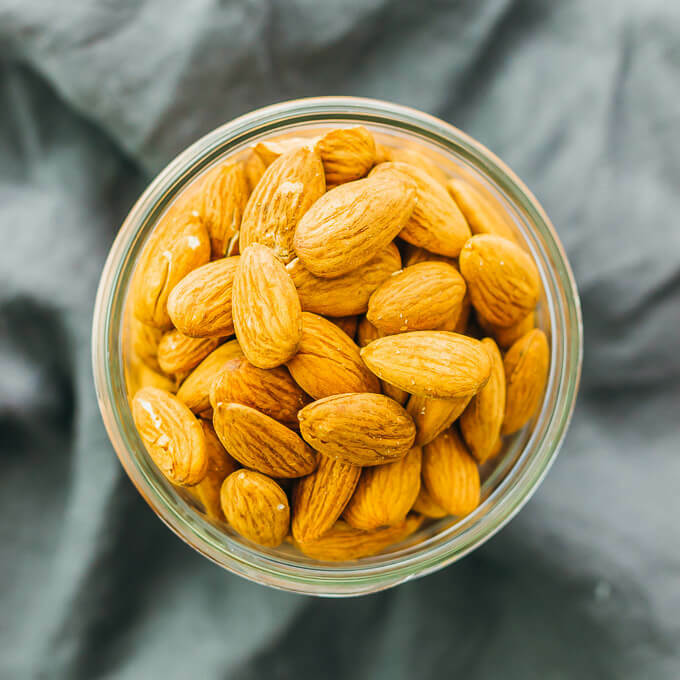 The almonds are quite hot after cooking, so make sure to let them cool down to room temperature before storing away (or snacking right away, can’t blame you!). For more delicious and healthy snack ideas — check out these bacon cheddar biscuits, spicy deviled eggs, crispy chickpeas, and peppered steak bites. 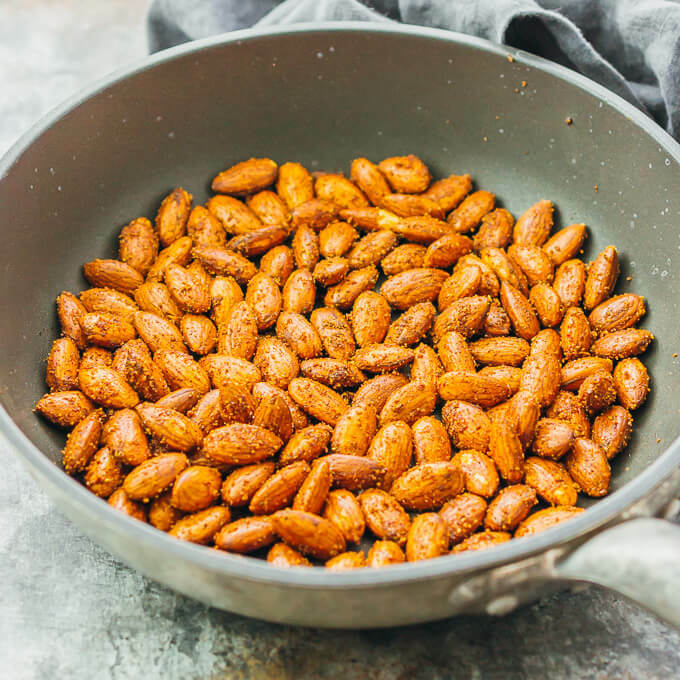 These spiced almonds have a smoky and garlic flavor, and are easily cooked in just 5 minutes on a pan. It's an easy vegan recipe that makes for a healthy and flavorful snack. In a small mixing bowl, combine all dry seasonings (paprika, cumin, garlic, cayenne, salt) and stir together until well-mixed. Heat olive oil in a small pan over medium heat for a few minutes until hot. Add the dry seasoning mix to the pan and stir with the oil. It should be hot and bubbling. Add almonds and stir until coated with seasonings, about a minute. Add sriracha sauce and stir until mixed well, about a minute. Transfer almonds to a plate. Cool before serving. I don’t have siracha, what should I do? You can try substituting with another type of hot chili sauce. I really love almonds! Gonna have to try this out this weekend. Thanks for sharing! Did somebody say snacktime? Seriously, these look AMAZE. Can’t get over ’em! Thanks Karly! I’m going to be making these again soon!